A basic rule is to store a minimum of ONE GALLON of water PER PERSON, PER DAY for at LEAST 3 days. 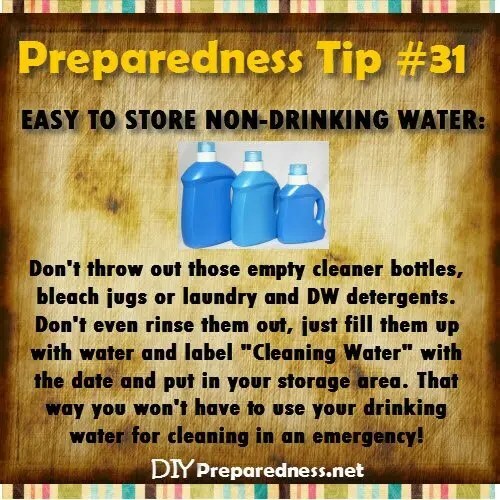 Three days is a minimum suggested by FEMA – but a better consensus for a minimum is to have TWO-WEEKS WORTH of water stored and available. 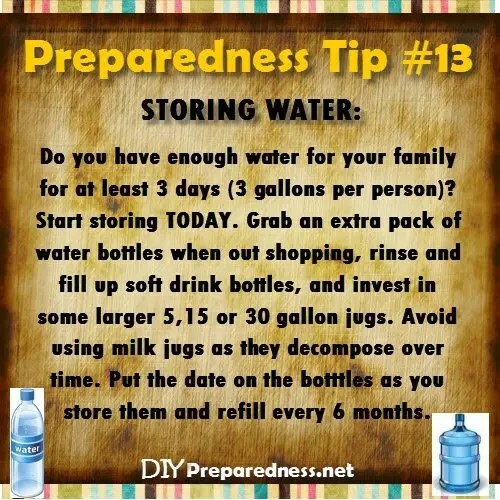 If you can store up to a month or more of water for those in your household, I would do it! WHAT CONTAINERS DO I STORE WATER IN? Any food grade container that can be sealed closed! I personally do not use old milk jugs because the plastic is thin and not meant for longer term storage. But it’s better than nothing, so if that’s all you have – go for it. You can use other food containers like soda liter bottles, juice containers, individual soda/Gatorade bottles, any other plastic jugs used for food. Always be sure that you have cleaned any containers thoroughly first. There are a myriad of water containers available. From huge tanks, big steel and plastic totes (used on farms a lot), water bladders that you can store in your home’s crawl space, water boxes to be stack-able, and several sizes of plastic drums, barrels and jugs. There’s a WaterBOB which fits in your tub and you can fill for 100 gallons of storage as well. I really like the WaterBrick stackable Jugs. They cost a little more but they stack great. You can also buy bottled water. I would not use store-bought bottled water as my only source of water storage, but as part of it. For the most part, it’s probably safe. However, there are some who say that it is unsafe to store bottled water. Read about that here. DO I NEED TO PRE-TREAT MY WATER WHEN STORING? If you filled up your water storage containers using tap water, it’s not necessary to pre-treat since tap water is already treated. However, many people still do pre-treat their water to keep things from growing while it’s stored. Also, if you pre-treat your water, you technically do not have to rotate it as often. Otherwise, it is recommended that you rotate your water storage every year to help prevent contamination. I may note here, that if you properly seal and store your water, it is my opinion that it can store much longer without being rotated. You can pre-treat with Water Treatment Drops, or even with plain bleach by putting in 1/8 of a teaspoon per gallon. Another option is to use Copper & Silver Ion treatment: 4 drops per gallon. 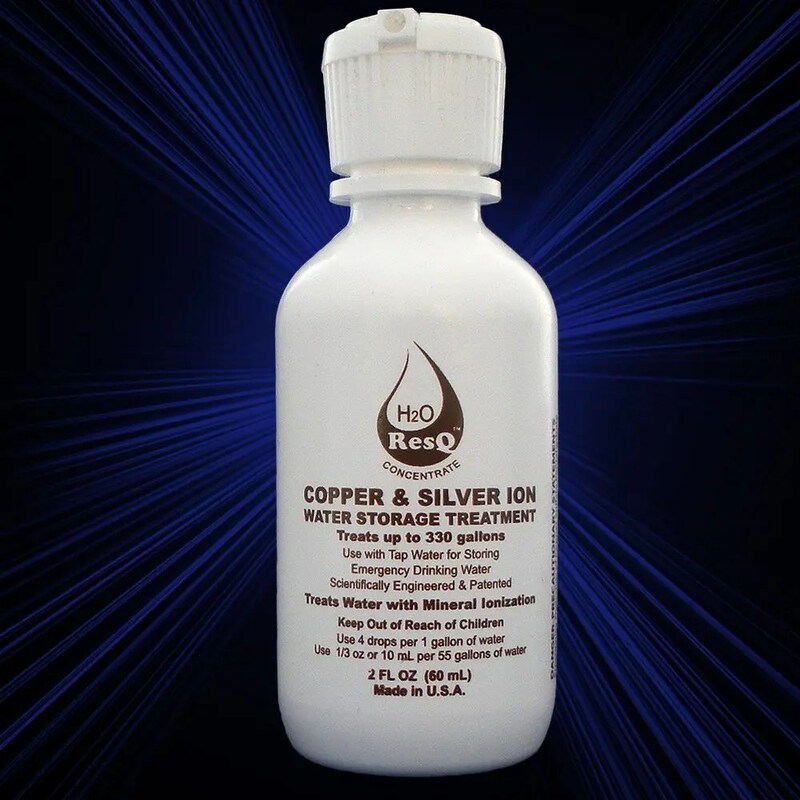 The Copper & Silver Ion drops can also extend the life of your water filter. I haven’t found these on Amazon, though. I got mine at some preparedness expo’s. Your stored water may taste different or flat when you go to use it. This is common and due to the fact that there is no oxygen in it. Swishing water around in an open container or between two different containers can help add in oxygen and get rid of that weird taste. If you worry about your stored water (or any water you are going to consume) being contaminated, you will want to clean it before using it. Here are the most common ways to get your water pure for drinking. Boiling – The oldest method for purifying water. It does kill most germs, microbes and parasites, however it can’t remove salts, heavy metals or chemical toxins. Bring water to a full boil (212 degrees) for a full minute to make it safe to drink. Some people say that you need to boil steadily for up to 10 minutes, however getting your water heated to 160 degrees for 30 minutes will kill all pathogens, or to 185 degrees for only 3 minutes. This is true even in high altitudes. One preferred method to heat your water is using a solar oven as it will save fuel. Distilling – Nature’s method of purifying water. There are several different methods, but basically it involves boiling water to produce vapor and leaving behind all contaminates. Then the vapor is put into a clean container and it condenses back into pure water. There are many methods and ways of distilling for at home or as survival. Plain Unscented Bleach – 1/8 teaspoon per gallon of water. Shake it up. Let it sit for an hour before drinking. Or use two drops of bleach per quart of water (4 drops if it’s cloudy) and let it sit for 30 minutes. Pool Shock – Be sure it’s 68% to 78% calcium hypochlorite. Create a chlorine solution by dissolving one teaspoon of calcium hypochlorite into one gallon of water. This mixture becomes a stock chlorine solution of about 500 milligrams per liter. To purify water, add ¾ ounce of the chlorine solution into one gallon of water. Pour back and forth from one clean container to another to aerate the purified water. Get more details here. Iodine – Five drops of 2% iodine per quart of water. Let sit for an hour. If water is cloudy use 10 drops per quart. Potable Aqua (Iodine tablets) – Typically two tablets per quart. Always double check the instructions on the bottle. Can be stored unopened for up to 4 years. For answers to questions on iodine tablets click here. Polar Pure – Uses iodine to purify, and one bottle will treat up to 2,000 quarts of water. Indefinite shelf life. Destroys waterborne pathogens, including Giardia and microorganisms. Thermometer on bottle shows the dose needed. Best value for the money. This is a top pick of mine. 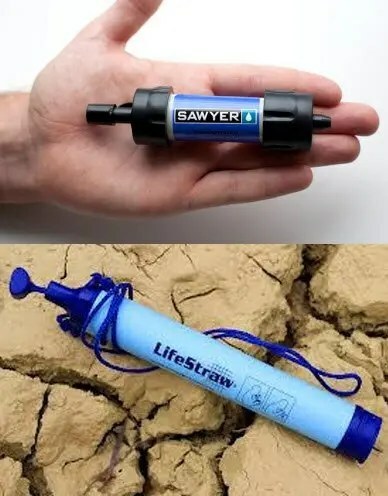 Water Straws – Two main water straws are the LifeStraw and the Sawyer Mini. They are both similar and effective. They are small and easy to carry and you can use them directly at the water source without waiting. Made for individual use. I think both of these water straws are effective and good. See a more detailed comparison of the two at this link. Water Filter Systems – Most notably is the Berkey Water filter system. They come in different sizes from the Travel Berkey (1.5 gallons), all the way up to the Crown Berkey (6 gallons). The Berkey is one of my picks, but I also pick the Sawyer filter. Some people use the Berkey filter or the Sawyer filter and make their own system using buckets. These filter systems can purify water for you family or groups of people in short amounts of time. This might be a better option for long term camping, or having in your home as a backup if tap water becomes contaminated. 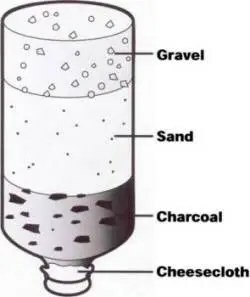 Home Made Filters – You can make your own most basic water filter using sand, soil, pebbles, and cloth. Some methods include gravel, sand, charcoal and cheesecloth. It is good to research and know how to do your own filtering. But keep in mind that it does not guarantee that microorganisms like bacteria will be eliminated from your water. Garage – When storing your water storage in your garage where there will be temperature changes, you will want to have your containers NOT directly on the cement so you can prevent any possibility of a chemical reaction between your containers and the cement. So have them sitting on a couple wood slats or a pallat or something to get them off the direct floor. The garage is a good place to store at least a portion of your water storage, because it is a place for quicker access. Also, if there was a disaster like an earthquake, it’s more likely that your garage will be easier to access than your home if there was structural damage. Closets / Under Stairs / Pantry / Bedrooms – These are also good places to for water storage, especially as you begin expanding. If you have end tables or cabinets that have space, consider filling with jars and jugs of water. If there is space behind furniture that isn’t being used – go for it. Just make sure your containers are closed tightly so there’s no chance of leaking or spilling. Basement / Cold Room – As you store large barrels of water in your basement, just be sure you have access to it. Once filled, you won’t be moving them. Be sure and have more storage in other places so that if the basement ever became inaccessible, you’d still be able to reach some of your water stores. Consider your portable water stores and how you can get to them quickly for an evacuation, and your longer term larger water stores that will not be moved. Location is important. I believe in diversity. So think it’s smart to have two or three different types of containers I store water in and two to three different types of ways to purify water. 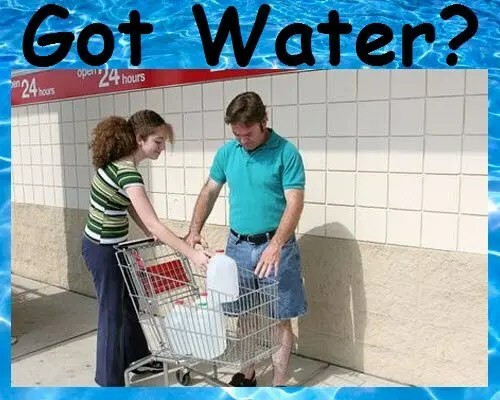 I want to have water that is easy to carry if I needed to evacuate and ways to purify that would be quick if we needed it fast. Diversity is key when it comes to water and food storage. If you don’t have any water storage yet… I wouldn’t’ worry so much about the particulars. I would first GET STARTED by filling up clean containers. Then as you go, get some new container or used ones and build it as you go. There are so many reasons that we need water in our daily lives and so I definitely agree with you about how necessary it is to store it. In fact, my family keeps a water tank in our garage just in case we ever experience an emergency. However, we don’t like to treat our water before we store it. Since we don’t do that, how often do you think that we should rotate our water? It is recommended to rotate water storage every 6 month to 1 year. However, I personally don’t rotate mine that often, but more like every 2-3 years. If you store from your tap water, it’s already been treated. If I feel like I need to treat my water (due to fear of contamination) after I open it, I will do it then. Or just provide some oxygenation to take out the stale taste. That is such a great idea to add oxygenation to take out the taste! Perhaps I should get some of that just in case we ever need it. Thank you for being so helpful! I had no idea that you should store at least a gallon of water per person per day. Even though its recommended to store for 3 days, it would probably be a good idea to have more than that just in case. My husband was thinking of maybe installing a large water tank in our home or even outside, but we’re not sure about that yet. We’ll have to do more research on them.